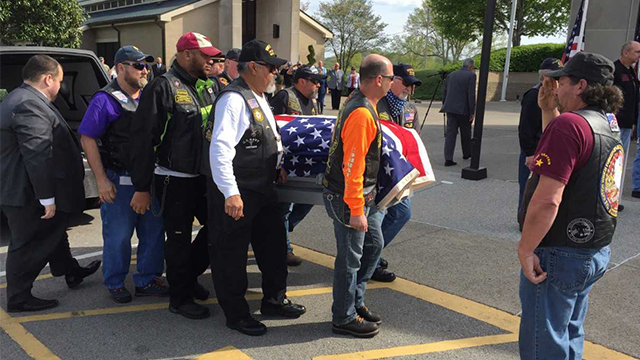 MURFREESBORO, Tenn. (WKRN) - Around 100 people from around Middle Tennessee headed to Murfreesboro on Wednesday morning to attend the funeral of a local veteran with no known relatives. Charles “Billy” Johnson, called a "staple of Downtown Murfreesboro," served in the Vietnam War as a U.S. Army Infantryman. "Sadly, Billy is without any known relatives," Matthew O'Dell wrote on Facebook. "This means that we have the honor of standing in as his family and friends." Dozens answered the call on social media, converging on the Middle Tennessee Veterans Cemetery this morning to pay respects. "I have very fond memories of Billy," O'Dell said. "With his warm smile, kind heart, and gentle wave, he illuminated the downtown square on a daily basis. Even if coffee wasn’t on Billy’s agenda for the day (which it almost ALWAYS was... 😉), I would see Billy enjoying his daily walks, while listening to his favorite tunes on his Walk-man." A group of veterans at the funeral proudly volunteered to be pallbearers. "Remember: You have the ability to change someone’s life and to be the light in their darkness," O'Dell said. "YOU are the wake-up call. YOU are Reveille!"